A 100-foot Ferris wheel in Leicester. A new major addition for this year’s Diwali Festival. Diwali is a five-day festival celebrating light, knowledge and good nature. Diwali – derived from the Sanskrit, ‘deepawali,’ means ‘row of lights‘ – also marks the beginning of the Hindu New Year. In Hinduism, light is seen as a metaphor for self-improvement, self-awareness and community, and its celebration allows followers to reaffirm their commitment to such values. Some followers will pray for good business prospects in the months to come. Most Diwali celebration around the world focus on family and friends. As Diwali approaches, people also clean their home to escape bad luck in the upcoming year and families gather for a feast and stay up late, celebrating with the help of crackers and sweets. They believe that the Hindu Goddess of good luck visits homes that are brightly lit. Fireworks displays have become an integral part of Diwali celebrations both in India and around the world. All the more because the festival takes place around the night of the new moon (Amavasya). This timelapse video shows the displays taking place over the city of Vijayawada, in Andhra Pradesh province, India. One of the biggest Diwali events outside India takes place in Leicester, UK. Hindu is the third biggest religion in the city. In Leicester, celebrations attract more than 35,000 people to the Belgrave Road for the switch-on of its lights and for the Diwali Day event. From 5 p.m the city’s busy Belgrave Road will become a pedestrian-friendly arena hosting Indian dancing, music and dhol drumming, building up to the switch-on of the Diwali lights at 7.30 p.m. 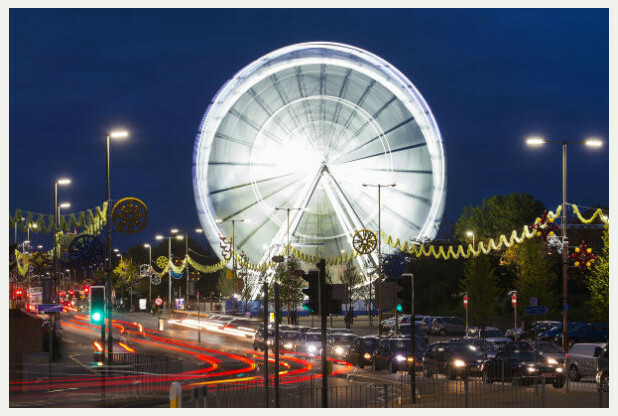 This year, there is a major new addition to the event, the Wheel of Light – a 100-foot illuminated Ferris wheel.